Shoot Out, Allen and producer Funches go over news on the NBA playoffs, could Zion Williamson be number 2 and other NBA news... Allen welcomes ESPNLA's Amin Elhassan who talks about the Magic's departure, the coaching search, the Lakers in-family philosophy, the Pat Riley rumors, and a look at the playoffs. The Power 5 has Allen and producer Funches choose their top 5 national foods. Shoot Out, Allen and producer Funches go over news on Zion Williamson's NBA Draft declaration, Luke Walton to coach the Kings, Sir Charles' LeBron invite and other NBA news... Allen welcomes ESPNLA's Brian Kamenetzky who talks about his current article in "The Atlantic" about the impending decisions for Jeanie Buss and the Los Angeles Lakers. The Power 5 has Allen and producer Funches choose their top 5 playoff match ups. Allen Silwa breaks down the news that Luke Walton is OUT as Lakers head coach. Where does the team go from here? Does the blame for this season fall entirely on the front office or does Luke Walton deserve some blame? Allen takes calls from the audience for their thoughts and opinions. Allen Silwa continues to take calls from Laker fans who voice their opinions on where does the team go from here. Mason and Ireland Producer Greg Bergman joins to discuss the chaotic situation the Lakers are in. An impromptu Power Five where Allen and Producer Jessie Lopez give their top five replacements for Walton. Allen opens talking about Magic Johnson resigning as president of the Los Angeles Lakers. Allen isn't too pleased with the front office and placing a big chunk of blame there and so do our Laker callers as they continue to vent. Jeanie Buss' name keeps coming up as the one who is responsible for the Purp and Gold problems, seems that it's all on her shoulders now. An extra hour of Lakers Talk and Allen welcomes Tania Ganguli, LA Time beat writer comes on and talks about the factors dealing with Magic's departure, the non reported inside fighting, the pressure on Jeanie Buss and what's next... Callers come on with all kinds of opinions regarding Magic, Jeanie and the Lakers. Allen wants to know more of the story that we may not know... The Power 5 has Allen and producer Funches choose their top 5 best run NBA front offices. ESPN NBA Insider Dave McMenamin joins Allen Sliwa to help break down the latest with Magic Johnson leaving the Lakers prior to the season finale. What happens next for the Lakers going into free agency? ESPN Senior Writer Ramona Shelburne joins Allen Sliwa to discuss the shocking news of Magic Johnson stepping down as President of Basketball Operations for the Lakers. Where does the franchise go from here? The ragtag group of G League players from the South Bay Lakers get another win, this time against another playoff team in the Utah Jazz. Where has this hunger and passion been all season long for the purple & gold? Lakers get blown out by the defending champion Warriors as KD, Klay, and Boogie are free agents after the season. Could we see one of them head down south to suit up in the purple & gold and which ones are most likely to leave Golden State? Allen opens talking about what LeBron's grade would be for this season. Laker teachers fill out LeBron's Lakerland report card. Allen goes down the bench to see which player should come back and play season two for the Purple and Gold... Allen welcomes Lakers guard Alex Caruso who talks about his path to the NBA and his tenure as a Laker. Allen reacts to the news that LeBron's 1st season with the Lakers is over after he was shut down for the remainder of the regular season. How does the King's 1st season with the purple & gold grade out and what does the future hold? Lakers get their 3rd straight home win against Kemba Walker and the Charlotte Hornets. Could Kemba Walker be a free agent the Lakers target and where would he rank on their priority list? The Lakers have many decisions to make this Summer and a number of players will be coming off the books when this season is over. What players do you think should stay on the roster and what players are you happy to see go? Allen has JaVale, Bullock and Caruso as the 3 players with expiring contracts that I would like to see stay on. Despite a 2nd straight win from the Lakers and an ankle breaker highlight by Lance Stephenson, the focus is still on the offseason and what Magic Johnson & Rob Pelinka need to do to turn the LeBron led Lakers around for next season. Shoot Out, Allen and producer Funches go over news on the March Madness tournament, the Big 3 League, other NBA news and Shaq's appetite... Allen ask the question, "Have Laker fans been fair with LeBron?" and callers fly in with their take. Mike Trudell, Lakers sideline reporter joins Allen and talk about media criticism of LeBron, move strategy for the off season and more. The Power 5 has Allen and producer Funches choose their top 5 second tier players to join the Lakers next season. Allen opens talking about LeBron possibly given too much power by the Lakers organization. Callers roll in with their opinion on LeBron and if he has too much power. What do you want to see from LeBron next year that you didn't see this year... Allen wants to see more from everybody not named LeBron. Shoot Out, Allen and producer Funches go over news on the disappointing Lakers season and other NBA news... Allen looks at the unjustified blame at Luke Walton and callers point their fingers. Allen welcomes Lakers Nations' Trevor Lane who talks about the remaining season, potential free agents to pursue, blaming Luke and more. The Power 5 has Allen and producer Funches choosing their top 5 sporting events to attend. Allen opens talking about all the things that went wrong this season for the Lakers. This in the summer to get a top tier free agent to the Lakers. Lakers fans hit the phones and give their opinion of the season. Allen defends him but ask callers the question "Why should Luke Walton be fired," and they give him their thoughts. Shoot Out, Allen and producer Funches go over news on the disappointing Lakers season and other NBA news... Fans still haven't had enough and keep piling on the Lakers and LeBron. Who is the second piece to come to the Lakers and complement LeBron... ESPN's Amin Elhassan joins Allen and talks about the pitfalls for the Lakers this season and more. The Power 5 NBA all time point guards. Lakers drop another game, this time to the Celtics, and it's on the heels of Ingram & Lonzo being ruled out for the rest of the season. Can Magic Johnson turn things around this summer in free agency and get another superstar to play with LeBron? Shoot Out, Allen and producer Funches go over news on the Lakers decline and other NBA news... ESPN Senior Writer Ramona Shelburne joins Allen and talks about all the ramifications of the Lakers season end meltdown. Allen looks ahead to free agency this summer and goes down the unrestrictive agents who can be had without giving up the young core pieces. The Power 5 things that went wrong this season. After another loss to the crosstown rival Clippers, Allen looks at the difference between the front office of the Lakers and that of the Clippers as the franchises are heading in opposite directions. Brandon Ingram shines in another big offensive game, but the Milwaukee Bucks pull away late as they defeat the Lakers in STAPLES Center. Can the Lakers make their way back into the playoff picture before the end of the regular season? Luke Walton made the call to go small with his starting lineup by starting Rondo against the Pelicans and it got them a much needed win in STAPLES Center. Could we see the small ball lineup more for the rest of the season? Allen Sliwa and Michael Funches go around the Association in Shoot Out! Topics include Paul Pierce suggesting the King sits down, being stuck in the elevator, and baby momma drama. Shaq has some comments for the Lakers. Allen and Michael list the worst Laker loses this season in Power 5. The Lakers shock the Houston Rockets with a double digit come from behind win late in the game off of good performances from Ingram and Kuzma. Can they continue to be this consistent down the stretch and actually make this team a playoff contender? Lebron James has to make the Lakers' way to the playoffs. Lebron has to lead the team all by himself. Allen takes calls on this subject. Senior writer Taylor Lane calls in to discuss what exactly Lebron needs to do to get the Lakers into the playoffs. Jessie joins Allen for the shootaround to talk about NBA standings, Adam Silver, playing for DC, & the All-Star game halftime show. What do the young guys need to do to get the Lakers into the playoffs? Allen takes calls to hear everyone's thoughts on this. Luke Walton needs to stand up and lead the team better. How do the Lakers lose to the Atlanta Hawks? This team is struggling for an identity and everyone is to blame, from the Front Office to the Coaching to the Players. Not sure how much the All Star Break will help, but this is a debacle. Allen opens talking about the NBA investigation concerning the alleged tampering comments by Magic Johnson surrounding Philly's Ben Simmons. Can the Lakers make the playoffs... Allen looks at the surrounding factors of this challenge. Will Guillory, the Pelican's beat writer for The Athletic joins Allen and talks about the perception of the Lakers organization around the league, the Anthony Davis sweepstakes and more. Shoot Out, Allen and producer Funches go over news on the NBA trade deadline, the Lakers and other NBA news... Allen makes the point that the Lakers need Lonzo Ball back. Allen revisited the alleged Magic Johnson tampering comments along with 76'er GM's Elton Brand's reaction. Bill Oram, Lakers beat writer for The Athletic comes on and talks about the Magic Johnson "we are all professionals" comments concerning the proposed trade for Anthony Davis along with the Power 5. Allen started the show talking about the "trade that wasn't" with Anthony Davis staying put (for now) in New Orleans and the Lakers staying pat with the young players. Allen feels we shouldn't blame Magic Johnson for going "all in" on a trade for AD. Plus, some reaction to Rajon Rondo's buzzer beater that helped the Lakers beat the Boston Celtics. The Lakers are showing major instability leading up to trade deadline. Last night's 42-point blowout to the Indiana Pacers def shows that players/coaches are being affected by all the trade chatter. What may be best for the Lakers is just getting past the deadline, with or without Anthony Davis. Magic has done his part to try and get AD, but the Pelicans donÃ¢`â„¢t look like they want to do a deal with the Lakers. It may be time to move on and focus just on getting into the postseason. Allen Sliwa discusses the ongoing saga with Pelicans star Anthony Davis. The Lakers are going all in, but will the Pelicans accept the latest offer? Allen takes calls from the fans who weigh in on trading away the whole young core for Davis. Also, Lakers beat reporter for the LA Times, Tania Ganguli joins Allen for more insight. Allen Sliwa and Michael Funches talk about the hottest news in the Association during Shootout! Topics include a trade involving a Laker no one is talking about, unicorn on the move, and the Mamba comments on how James Harden plays the game. What happens if Rob and Magic strike out in trading for Anthony Davis? A double turn of good fortune for the Lakers as they see the return of LeBron James to the court and get a big win over the Clippers in overtime. Allen is joined by Jovan Buha who covers the Clippers for The Athletic as they break the game down. Also, will the Lakers & Clippers be battling for a playoff spot and the same free agent in Kawhi Leonard? Plus, will the Pelicans fold and give Anthony Davis what he wants? Brandon Ingram has a career night in a loss to Philly and seems to have benefited the most from the return of Rondo. Will we see the return of LeBron & Kuzma to the lineup against the Clippers in an important game that has playoff implications? Allen Sliwa discusses the news out of New Orleans that Anthony Davis does not plan on signing an extension and wants to be traded. Do Magic and Pelinka make a move for star player now or play the waiting game? LonzoÃ¢`â„¢s camp reported said they would prefer to go to a third team if traded. Allen debates if the Lakers should trade away the entire farm for AD. Allen Sliwa and Michael Funches go around the Association in Shootout! Allen is joined by former Laker and current Spectrum SportsNet analyst Robert 'Big Shot' Horry. They discuss the idea of Anthony Davis joining the Lakers and preview tomorrow nightÃ¢`â„¢s matchup against the 76ers. Allen plays sound from reporters reacting to the situation surrounding AD. Ivica Zubac set up shop on defense with multiple blocks against the Phoenix Suns as he led the Lakers to a win with a double-double in points & rebounds. How will Zubac be able to handle All-Star Center Joel Embiid when he brings the 76ers to STAPLES Center next? Despite an excellent return for Rajon Rondo from injury, the Lakers get bullied by the Timberwolves and fall further out of the playoff hunt. With no Lonzo and now a new injury to Kyle Kuzma, how long can the Lakers wait before needing LeBron to come back? Allen Sliwa takes a look at the standings to start the show. Lakers are currently sitting 9th in the West, just outside the playoff bubble. Is it time to panic? Allen takes a look at other players who suffered the same injury as Lonzo Ball to gage a timetable on his return. Allen briefly talks about Melo to LA. Allen Sliwa takes a break from score watching for some Shootout with producer Michael Funches. Topics in Shootout include former Laker D'Angelo Russell, Zion Williams, and big game anniversary that Laker fans will remember. ESPN NBA Reporter Brian Windhorst joins Allen to discuss the latest on the Lakers. The Warriors blow out a different Lakers team than the one they faced back on Christmas - no LeBron, no Rondo, and no Lonzo means the Lakers' health will continue to be an issue. What could the potential return of Rondo in the next game do for the already thin Lakers' lineup? Can the team make up ground in the playoff race once LeBron makes his return? The Lakers go wire to wire with the Houston Rockets but drop a heartbreaker in overtime after Lonzo goes down to an ankle injury. Is there anything positive to take out of a loss like this? What do the Lakers do without Lonzo, Rondo, or LeBron in the lineup? The Lakers get a much needed win against the Chicago Bulls with a new starting lineup from Luke Walton. Was this a one game change to the lineup or could there be more changes coming? Also, the Lakers are about to run the gauntlet against the Thunder, Rockets, and Warriors; can they survive it? Allen Sliwa recaps the disappointing loss against the last-place Cleveland Cavaliers. The fans call in to give their thoughts on what is going with the squad without LeBron and Rondo. The injury to LeBron has shed some light on issues the team has, but expectations remain the same. Allen Sliwa takes calls from disgruntled fans for their opinions on what is going on with the Lakers before going into Shoot Out with Producer Michael Funches. Some of the topics in Shoot Out include the Bulls holding on to Robin Lopez, a cheat day gone wrong, and the Mailman gets a statue. Ohm Youngmisuk joins Allen to take a deep dive into the Lakers. A bad loss to a bad Cavs team has the Lakers tied for 8th place in the Western Conference. With their schedule only getting tougher moving forward, can the Lakers survive before the return of LeBron James to the court and still make the playoffs? Allen discuss a big night for Kuzma, Lonzo, and Ingram against the Detroit Pistons. Are you sold on Zo & Ingram keeping this up? Is there something they can learn from Kuzma when it comes to being aggressive? Allen Sliwa recaps the Lakers victory over the Dallas Mavericks. He gives credit to Lonzo Ball and Brandon Ingram who step up in the win. Is it time to make a move for Anthony Davis? Senior Writer for Lakers Nation Trevor Lane joins Allen to recap the victory in Dallas, the young core, and what it'll take for the team to keep this momentum without LeBron. Allen Sliwa and Michael Funches discuss the hottest news going on in the Association during Shoot Out! Some of the topics include Kristaps Porzingis, Vince Carter returning to Toronto, and the Greek Freak challenges the Great One. Laker analyst for Spectrum SportsNet, Mike Bresnahan joins Allen to discuss the Dallas victory and preview the game against the Detroit Pistons. It's time for Shoot Out with producer Funches. LeBron commented that he is the GOAT which springboards the conversation on who is the GOAT. Allen picks his list of MVP candidates for the year. Allen and producer Funches compare and pick their Power 5 gridiron games. ESPN's Ramona Shelburne comes on and talks about the loss to the Knicks, why the youngsters couldn't get things going and more. Lakers continue to struggle without their vets, this time losing to the OKC Thunder 107-100. In the process, they lose Kyle Kuzma, MRI tomorrow on his lower back. ItÃ¢`â„¢s almost impossible for the Lakers to beat top notch teams with all these injuries. However, Lonzo didnÃ¢`â„¢t do enough on offense, Ingram played too much Isolation ball and Luke didnÃ¢`â„¢t make enough adjustments. No excuses this Friday when you take on the New York Knicks. Allen breaks down the back to back losses for the Lakers and discusses whether or not the team can keep pace in the Western Conference without LeBron, Rondo, and McGee. Can Ingram learn to take control of games while the purple & gold wait for the return of LeBron? Allen breaks down the big Christmas Day win over the Warriors and just how significant it is for the team & how the rest of the league views the Lakers franchise. Is the return of Rondo and the emergence of Zubac what the Lakers were waiting for? Also, an update to LeBron's injury; is Ingram the one that needs to step up in the King's absence? Plus, is LeBron the right 'pitch man' for the Lakers for free agency? Allen Sliwa hosts a special edition of Lakers Talk right after the Lakers were defeated by the Memphis Grizzlies at home. Allen breaks down the loss and finds some positives from the game. Senior NBA Reporter from Yahoo, Chris Haynes joins to discuss the loss, facing the Warriors, and Anthony Davis. Allen and Producer Michael Funches go around the Association in Shootout! Allen Sliwa goes from hot to cold after the Lakers split the weekend games. Eric Pincus from Bleacher Report joins Allen in-studio to discuss his latest article that suggests Brandon Ingram might not be a part of the Lakers long-term plans. Allen and Eric dive into the analytical numbers behind Ingram and LeBron James before taking calls from the audience. It's time for Shootout With Allen Sliwa and Michael Funches. They discuss the hottest topics going on in the NBA. ESPNLA's own Brian Kamenetzky joins Allen to discuss the Lakers most recent road trip, Brandon Ingram, the game of James Harden before looking ahead to Brooklyn and New Orleans. Allen and Michael give their top 5 all-time shooting guards. Allen Sliwa recaps last night's victory over the Miami Heat. Since Lakers signed Tyson Chandler they've won 13 out of 17 games as Allen is joined by the Lakers center and discuss Tyson coming to LA, his defensive presence, and playing with the young guns. Is it safe to say that the young core of Ingram, Kuzma, Lonzo, and Hart are a collective X-factor? Allen Sliwa and Michael Funches talk about the biggest stories in the Association in Shootout! Some of the stories include a shooter possibly on the move, conspiracy theories, and all-time starting 5. Allen breaks down the potential of Trevor Ariza coming back to the Lakers. Spectrum SportsNet Lakers host Chris McGee joins the show to discuss all things Lakers. Lakers playing some great basketball, specifically Lebron James. Hope we are all appreciating what he'€™s doing for our team. As for Kevin Durant comments, I have no idea what he'€™s talking about. Lebron wins and makes everyone on his team better. Why would a younger player not join what the Lakers are building? You got a shot at a Chip and you play with one of the most unselfish Greatâ€™s to ever play the game. As for Carmelo coming to LA, no "thank you." Allen Sliwa recaps yesterday's win over the Phoenix Suns before being joined by Lakers play by play announcer for Spectrum SportsNet, Bill McDonald. Allen truly believes this team is starting to gel and as the season progresses, no one will want to face them. Allen Sliwa and Michael Funches go around the NBA with Shootout! Some of the topics in Shootout includes heckling fans, top rookies, and the pancake king. How deep of a playoff run can this team make if Lakers make no more roster moves? ESPN NBA Reporter Dave McMenamin joins Allen to discuss the continuing improvement of Kyle Kuzma and the rest of the young players. Allen gives some love to Luke Walton. Lakers give up a 32 point blowout loss to the Nuggets in Denver after an abysmal shooting and rebounding night. Did Lonzo avoid a serious injury and what does LA need to do to be ready for their next matchup in STAPLES Center against the Indiana Pacers? Allen Sliwa starts off saying the Lakers were playing great but were due for a loss. He also believes the team is closing out games better. Lakers point guard Lonzo Ball joins Allen for a conversation about the season, matching up against Jamal Murray tomorrow against the Nuggets and playing with LeBron. Allen thinks 11-8 is right where the team should be. Allen Sliwa and Producer Michael Funches talk about the biggest stories in the Association during Shootout. Bill Oram from The Athletic hops on with Allen to discuss all the latest from the Lakers, including an update on injured guard Rajon Rondo. ESPNLAâ€™s own Jorge Sedano also joins Allen to give his own thoughts on how the team has been playing so far. Allen Sliwa recaps the weekend slate of games for the Lakers, loss in Orlando and win in Miami. Are the Lakers youngsters facing too high of expectations? Should the team look to make a trade while they still have value? Allen debates who is the number 2 guys behind LeBron. Listeners call in to give their thoughts on what the team should do with the young core. It's time for Shootout! Allen Sliwa and producer Michael Funches go around the NBA and discuss the top stories from the Association. Allen also discusses LeBron's return on Cleveland as the Lakers prepare for the Cavs tomorrow night. Senior writer for Lakers Nation, Trevor Lane joins Allen to discuss what the team could do with the young core and LeBron returning to Cleveland. Allen discussed LeBron's best performance as a Laker, as LeBron dropped 44 pts and passed Wilt Chamberlain for 5th all-time on scoring list. Plus, who will step up in the absence of Rajan Rondo: Lonzo or Ingram? And, Allen thinks the Western Conference is "wide open." Allen Sliwa starts off the show with a special guest, Lakers forward Kyle Kuzma. They discuss the team being over 500, playing with LeBron, and his progression this season. Allen talks about what players have surprised him so far. Listeners call in to give their thoughts on which Laker youngster has been the best player so far. Allen Sliwa and Producer Michael Funches talk the latest NBA news during Shoot Out. Despite all the noise surrounding Luke Walton, Kyle Kuzma gave high praise to him and the rest of the coaching staff. Stephen A. Smith joins Allen to discuss all the latest with the Lakers. This weekâ€™s Power 5 goes in a different direction as Allen and Michael give their top 5 in the NFL. Allen Sliwa recaps the weekend back to back for the Lakers, an upset win up north in Portland followed by a blowout loss at home against a Kawhi-less Raptors. After ten games Allen still sees no identity with the team. Allen asks the fans what they think of LeBron James so far. Has he fully arrived yet? Who should be in the starting 5, Brandon Ingram or Kyle Kuzma? Allen Sliwa and Producer Michael Funches talk some of the latest hoop news in Shoot Out. Stephen A. Smith calls out head coach Luke Walton for how the team is playing so far as fans call in to give their thoughts on the team. The radio voice of the Minnesota Timberwolves, Alan Horton joins Allen to preview Wednesdayâ€™s match-up against the T-Wolves. Lakers get a big win on the road against Portland, but give up another big lead. Did Magic speaking up motivate the team? What will Tyson Chandler add to the squad? Allen Sliwa discusses the latest stories surrounding Lakers President Magic Johnson and head coach Luke Walton. Is Walton really in the hot seat? Allen asks the listeners for their opinions. ESPN NBA Reporter Dave McMenamin joins Allen to discuss the slow start to the season and his thoughts on Magic Johnson and Luke Walton. Allen Sliwa and producer Micheal Funches take a look around the league with ShootOut! Allen debates if head coach Luke Walton is really on the hot seat. Feeling that Luke needs more games under his belt before deciding his fate. Senior NBA writer for ESPN, Baxter Holmes join Allen to discuss Luke, Magic, and the season so far. Lakers have great dilemma, Rondo returns tomorrow vs Rockets and Ingram on Monday vs the Timberwolves. The Lakers have won 2 in a rown with Lonzo and Kuzma in the starting rotation. Should the Lakers keep it that way or go back to what they had before the suspensions. Allen Sliwa recaps the Lakers first victory of the season over the Phoenix Suns. Should Josh Hart stay in the starting lineup? The listeners call in to give their thoughts. NBA ESPN Reporter, Brian Windhorst joins Allen for a late night Laker chat. Allen rates LeBron's play so far in the early stages of the season. Rondo, Ingram, & CP3 threw down in the Lakers home opener at STAPLES Center and got ejected for it. Why did things escalate and get out of hand? The Regular Season is finally here!!! Allen wondered why the Lakers weren't playing on the 1st night of the NBA and predicted what could happened on "Night 1" for the Lakers when they play the Portland Trail Blazers on the road. Allen also thinks the Lakers will go "as far as Lonzo Ball and Brandon Ingram takes them." Plus, Lakers Nation's Trevor Lane came on to talk about expectations for the first game and the season for the Lakers. And, Kerry Eggers of the Portland Tribute and Jonathan Feigan of the Houston Chronicle came on to preview the Lakers/Blazers and the Lakers/Rockets. Also, "Shootout" with Producer Funches. Allen talks about the initial significance LeBron has already impacted the LA market. Allen makes the argument that LeBron has to get a chip to gain respect in the City of Angels. Callers opine. Svi Mykhaliuk, Lakers rookie comes on and talks about all aspects of playing for the Purple and Gold. Shoot Out, Allen and producer Funches go over news on King James, the Lakers and other NBA news... Allen ask... are we underestimating Lonzo Ball's potential... Mike Bresnahan, Spectrum SportsNet comes on and talks about the upcoming Lakers season, the starting line up and more. Power 5 has Allen and Producer Funches countdown the top five Eastern Conference teams. Allen Sliwa and Michael Funches have the first official Shoot Out of the 2018-2019 NBA Season. Brandon Ingram remains a key part of the Lakers future as listeners call in to give their thoughts on the young forward. Allen plays some post game sound from last night's game. The Power 5 looks at the top Laker games this season. The 2018-2019 season has begun as LeBron James makes his Laker debut in San Diego. Allen Sliwa recaps the Lakers first preseason game against the Nuggets. Ohm Youngmisuk, who covers the NBA and Lakers for ESPN, joins Allen to get his thoughts from last night's game and LeBron in a Lakers uniform. Allen looks back at some of the moves made that led to LeBron joining the Lakers. Allen talks about the Lakers media day and LeBron's comments at the event. Allen talks with callers about the expectations put to by LeBron and Magic. Dave McMenamin, ESPN NBA Analyst comes on and talks about LeBron's tempered appearance at today's media day, the expectation for the youngsters this year, options in the future for the Lakers, the challenges for Luke Walton and more. Allen talks about Rajon's respect for Lonzo's game and respectively, Lonzo on Rajon. Shoot Out, Allen and producer Funches go over news on King James, the Lakers and other NBA news... Allen and the callers talk about the expected growth from each of the youngsters on the Lakers. Brad Turner, LA Times writer comes on and talks about today's media day versus past media days, LeBron's preparation for his inaugural Laker year and more. Power 5 has Allen and Producer Funches countdown the top five Laker story lines for the year. Allen talks about Luke Walton's comment about how far the Lakers can go in the playoffs. Allen talks about the rumors of the Jimmy Butler possibilities coming to LA. Allie Clifton of Spectrum SportsNet joins Allen and talks about the LeBron Luke Walton relationship and the upcoming season. Allen talks about what would be a failed season for the Lakers. Shoot Out, Allen and producer Funches go over news on King James, the Lakers and other NBA news... Is Jimmy Butler worth a max contract... Allen looks at his list of preferred top free agents. Jorge Sedano, ESPN Afternoon host comes on and talks about LeBron's and the Lakers plans over the next four years and the way to play with LeBron. Power 5 has Allen and Producer Funches countdown the top five things to look for at Lakers Media Day next week. Allen talks about the Lakers getting back on track with the winning mentality and getting into the playoffs. Allen ask, what is on your list to see from the Lakers... Allen says competition and how the youngsters handle the pressure; callers come in with their items. Mike Trudell, Lakers Sideline Reporter comes on and talks about the expectations for 2018-19. Allen talks about what was said at the ESPNLA event with Jeanie Buss, Luke Walton and Rob Pelinka. Shoot Out, Allen and producer Funches go over news on King James, the Lakers and other NBA news... Travis Rodgers, ESPN Morning co-host comes on with his observations and expectations for the upcoming season, what Laker issues does LeBron cover up, the pressure on the Laker youngsters and more. Power 5 has Allen and Producer Funches selecting the Top 5 point guards in the NBA. Allen talks about the buyout of the Luol Deng contract and how this helps the budget for landing a future top free agent. Allen takes a look at the historical front office moves the last couple of years up to the current state of the roster. Who is going to be available in 2019... Allen goes down the list and ask, who is the best fit for the Lakers... Bobby Marks, ESPN Front Office Insider comes on and talks about the buyout of the Luol Deng contract, free agents available in 2019, who the Lakers may target and more. Shoot Out, Allen and producer Funches go over news on King James, the Lakers and other NBA news... Allen reacts to Stephen A Smith's comment on which player is the best fit for the Lakers. Ryan Hollins joins Allen Sliwa on Lakers Talk and talks about the perception of the Lakers squad around the NBA, how the current front office has turned the team around, the competitive nature and basketball IQ of Rajon Rondo and more. Power 5 has Allen and Producer Funches selecting the Lakers opening night starting five. Allen talks about LeBron gaining respect in Los Angeles. Allen ask , is this LeBron's biggest challenge of his career... callers rush in and let Allen know. Dave McMenamin, ESPN NBA Analyst comes on and talks about LeBron mentoring the young core, his new challenges, working with Luke Walton and more... Which player benefits the most with the arrival of LeBron James... listeners call in. Shoot Out, Allen and Producer Funches go over news on King James, the Lakers and other NBA news... Allen reacts to Stephen A. Smith's comments on LeBron's and the Lakers upcoming year and their playoff position. Trevor Lane, Senior Writer at Lakers Nation comes on and talks about the potential of Brandon Ingram, who benefits the most with LeBron on the team, the biggest adjustment for coach Luke Walton and more. The Top 5 are the countries that Allen and Producer Funches would like to visit. Allen digs into how the NBA schedule will showcase the LeBron James led Lakers and the high leverage spots the young core will be put in throughout the season. Allen is joined by Marc Spears of The Undefeated to go over his favorite matchups for the upcoming NBA season. It's another edition of Shoot Out as Allen also catches up with our own Mychal Thompson & Mike Bresnahan of Spectrum Sportsnet as they go over the new look Lakers. Also, this week's Power 5 ranks the Christmas Day NBA games. Allen looks at Las Vegas' Westgate Super Book odds for wins for the Lakers and other Western Conference teams. How will LeBron have to 'adjust' his game, yes, the King will have some adjustments with his new team. ESPN's Ramona Shelburne comes on and talks about LeBron's challenges as an older player, Luke Walton's added work load with LeBron, and more. Shoot Out, Allen and producer Funches go over news on King James, the Lakers and other NBA news... Allen goes over the NBA coaches on the hot seat already. Spectrum SportNet's Chris McGee comes on and talks about LeBron's supporting cast, what should be LeBron's work load for the upcoming season and more. Allen reacts to Charles Barkley's comments on LeBron from earlier today and the Power 5 at 45 counts down the Top 5 Showtime Lakers. Allen starts off talking about LeBron's interview with Rachel Nichols and the surrounding cast around him. Allen goes down his goals for the Lakers for this season. Callers comment on what a successful season would be. Baxter Holmes, ESPN NBA Insider comes on and talks about the Lakers upcoming season with LeBron, expectations for the team and more. Shoot Out, Allen and producer Funches go over news on King James, the Lakers, other NBA news items and is Kobe coming out of retirement to play with LeBron... Ohm Youngmisuk, ESPN Lakers Insider talks LeBron off the court in Los Angeles, how to fit a team around him, what the expectations are for the Lakers and more. Allen's Power 5 at 8:45 showcases the current top 5 players in the NBA. Allen Sliwa briefly gives his thoughts about the recently vandalized LeBron James mural. Who will rise up to be the second-best player behind LeBron? Allen thinks it will be Brandon Ingram as he takes calls to see what the listeners think. Lakers TV Analyst Stu Lantz joins Allen to discuss all the offseason moves. Shoot Out with Allen Sliwa and Michael Funches. Allen takes a look at a recent ESPN NBA power ranking as he goes down the list to discuss where the Lakers and other teams rank. Listeners call in to give their thoughts on the recent power rankings. Lakers beat writer for the L.A. Times, Tania Ganguli joins Allen to discuss the latest news from the team. Allen Sliwa reacts to Kawhi Leonard getting traded to Toronto and likes that the Lakers didn't give up the farm for Kawhi. Allen says Lakers are in a great position to go after a great player in 2019. LeBron isn't getting any younger and will need some experienced help, callers weigh in. Spectrum SportsNet's Mike Bresnahan joins Lakers Talk and comments on the Lakers wait and see with Kawhi Leonard, the new free agent additions, Lonzo Ball's sophomore challenges, Josh Hart's Summer League transformation and more. Shoot Out, Allen and producer Mario go over news on King James, the Lakers and other NBA news. Magic Johnson and Rob Pelinka comment that there are no guarantees in the starting lineup except for... guess who... Allen and producer Mario pick their Lakers starting five. Magic Johnson guest on Jimmy Kimmel Live and spoke about not worried about the Warriors. Allen Top 5 at 9:45 showcases his time at the ESPYs After Party and Jerry West throws some shade at the Lakers. With LeBron James officially signing his contract today with the LA Lakers, Allen Sliwa wondered if Luke Walton is "fit enough" to coach the best player in the NBA. Allen took calls on the topic. Plus, Sliwa took calls from Laker Fans that believe the Lakers have a great shot of beating the Warriors, this season. Allen Sliwa was live in Las Vegas from the NBA Summer League as he spoke to Lakers Nation's Trevor Lane. The two talked about expectations for not only LeBron James, but also expectations for the other free agent pickups like Lance Stephenson and JaVale McGee. Also, "Shootout." Allen Sliwa is in Las Vegas for the NBA Summer League as he starts out with discussing whether or not the Lakers should look to add Carmelo Anthony to their roster. Also, what will Rajon Rondo bring to this Lakers roster along with LeBron James? Plus, can the Lakers afford to wait on Kawhi Leonard or do they need to get him now? Allen is in Vegas for NBA Summer League as he is joined by Arash Markazi for a special edition of Shoot Out. Arash sticks around to break down all the big news from the summer so far for the Lakers. Also, since it's a Vegas edition of Lakers Talk, the power 5 this week of the best 'Vegas Movies'. Allen starts off focusing on the Lakers front office conviction on delivering what they had been promising over the last year in landing LeBron James. Callers react to the Laker news of LeBron James' arrival to LA. In light of the Warriors acquiring DeMarcus Cousins, should the Lakers go hard after Kawhi Leonard... more caller comments. ESPN NBA Insider Bobby Marks comes on and talks about how all the dominos fell after LeBron signed on and how the money dishes out of the Laker coffers and more. Shoot Out, Allen and producer Mario go over news surrounding the NBA. Lonzo is putting on some weight over the summer as is Kyle Kuzma and Josh Hart, Allen likes the work he sees from the youngsters. Ohm Youngmisuk, ESPN NBA Writer comes on and talks about the diss track between Lonzo and Kyle Kusma, Jeanie Buss contentment with the direction Magic Johnson and Rob Pelinka have charted for the Lakers and more. Top 5 has the best dressed in the NBA. Saturday starts NBA free agency, Allen asks, will LeBron be a Laker... Allen gives out a realistic expectation of team Lakers with LeBron. Allen makes the premise that Paul George is more important to land than LeBron James. Caller come in with their take. Allen welcomes ESPN NBA Analyst Brian Windhorst who talks about the preparation for teams, like the Lakers, for NBA free agency, the decision making process of LeBron, the percentage chance Paul George goes to LA and more. With the offseason officially upon us, Allen Sliwa wondered how great the chances are for the Lakers to land LeBron James and/or Paul George. ESPN's Dave McMenamin, who covered the Cavs, came on with Allen to talk about the possibility of LeBron James coming to LA and some other NBA hot topics. Allen wondered if Kobe Bryant should be at the "big meeting" the Lakers will have with LeBron James sometime this Summer. Also, "Shootout." Plus, Spectrum's Mike Bresnahan came on to talk about Lakers, LeBron and NBA Free Agency. Allen Sliwa asks the listening audience why or why not the Lakers should bring in LeBron James. If LeBron came to LA and won a few championships, would that cement him as a Laker legend? Allen convinced at least one caller. Shoot Out and Top Five with Mario. Allen wonders if LeBron James and Paul George come to the Lakers, would they have enough to dethrone the Golden State Warriors? Allen took calls on the subject. Plus, Bleacher Report's Eric Pincus came on to talk Lakers and NBA Playoffs. Allen asked the question if the Lakers should try to win a title through Free Agency or sticking to the young kids through the Draft? Our own Mychal Thompson came on to talk NBA Finals, who's on the Mount Rushmore of NBA History and Lakers. Allen Sliwa asks Laker fans what is the best financial number for Julius Randle to return to the team. Dr. Robert Klapper joins Allen for some Klapper Vision on injured NBA stars DeMarcus Cousins and Kawhi Leonard. Also, Tania Ganguli, beat writer for the Los Angeles Times, joins Allen to discuss more on what the Lakers can do with Julius Randle. Shootout with Allen Sliwa and producer Mario. ESPN NBA Insider Ramona Shelburne is in Oakland covering the Western Conference Finals as she joins Allen to discuss the series so far and her thoughts on what the Lakers can do with Randle. Allen and Mario rank their top 5 Biggie songs. Allen started off the show discussing that the Lakers could build what the Boston Celtics have "already built." Allen is feeling down because he's rooting for the Celtics to beat LeBron and the Cavs. Plus, our own Jorge Sedano came on with Allen to talk Lakers and NBA Playoffs. The hour started off with "Shootout" and Allen's story of going Skydiving. Plus, Allen thinks the Lakers should practice "patience" when dealing with the future. Also, how is Kevin Durant going to be remembered? Allen Sliwa thinks that Lonzo Ball has to take a "leap" this Summer for the Lakers. Allen took calls on who has to take "the leap." Also, the youngest Ball Brothers, LiAngelo and LaMelo, came on with Allen to talk about their experiences in Lithuania. Plus, do you want LeBron James in LA? Allen and his crews wondered what Lonzo Ball will bring to the Lakers in Year 2. Also, Lakers Nation's Trevor Lane came on to chat about the current make-up of this current roster. Plus, "Shootout." Allen Sliwa started off the show talking about the problems in Oklahoma City and how that could help the Lakers in free agency. Should the Lakers give Paul George "max money?" Allen and his crew tried to answer the question. Plus, LA Times' Tania Ganguli came on to talk about Paul George and what he could possibly do in the Summer. Allen asked the question: Would you rather have DeMarcus Cousins, coming off injury, in the Purple and Gold or Julius Randle stay? Also, Allen had another great destination for Paul George that isn't Los Angeles. Allen Sliwa posed the question who would you rather let go from the Lakers... Lonzo Ball, Kyle Kuzma or Brandon Ingram? Also, calls on the job Luke Walton did this past season. Plus, Spectrum's Mike Bresnahan came on to talk Lakers and the upcoming offseason. ESPN's Amin Elhassan is in-studio talking all things NBA including Lakers off-season, NBA Playoffs and more. Allen Sliwa compares the Thunder roster with Paul George against the Lakers roster with Paul George. Plus, Shootout with Producer Mario Ruiz. Allen Sliwa asks who would you give up for Spurs star Kawhi Leonard, the best two-way player in the NBA. In the midst a five-year post-season drought, Lakers are desperate to win-now, but what would be the consequences of taking the win-now route opposed to letting the young core develop? Spectrum host Chris McGee joins Allen to discuss what routes the team can go in the offseason. Shoot Out with Producer Mario and Allen Sliwa. Assuming Lakers get the players they want, what will it take to get to back to playoffs? Allen doesn't think the offseason would be a failure if they miss on the big name free agents and focus on their young core and vets on one-year deals. Listeners call in to give their thoughts on who they would give up to acquire Kawhi Leonard. Allen talks about where should the Lakers focus be this summer? free agency or the young core? Besides LeBron James or Paul George who can the Lakers acquire? Also, Adrian Garcia Marquez, Spanish TV Play by play Commentator for Spectrum Deportes, calls in to talk about the success of this Lakers season. Allen takes calls on the Lakers success. Allen and Mario have the questions ready for Shootaround! Also, who should the Lakers be rooting for in the Playoffs? Should Paul Goerge stay in OKC if they get bounced out of the Playoffs early? Allen has a theory for Why Lakers fans don't want LeBron James? and Did Lonzo Ball live up to the Hype? Allen Sliwa is joined by star Lakers rookie Kyle Kuzma. After his recent play, is he the best Lakers right now? Will the team be okay if no superstars come to LA, but return the same core for next year? Fans call in and give their thoughts on the matter. Allen and Mario discuss whether or not the Lakers would be contending for a playoff spot if the team had stayed healthy. Shoot Out with Allen Sliwa and Mario includes talks about BBQ chicken, vintage jerseys, and a former Laker that is off to Charlotte. Allen says he would be fine if Lakers struck out on LeBron James or Paul George, as long as the team continues to improve. Kevin Ding from Lakers.com joins Allen to discuss the squad. Allen is joined by Andy Kamenetzky as they react to the Lakers loss to the Pistons to end their road trip. Allen wonders if the young team is regressing or if the mounting injuries are just too much to overcome. Also, who is the clear leader of this young Lakers squad? It's another edition of Shoot Out with Allen and super producer Mario. Also, ESPN NBA Insider Bobby Marks jumps on to discuss free agency and what he thinks the future holds for Julius Randle. Plus, what is the dream scenario for the Lakers coming out of free agency this summer? Allen Sliwa wondered if Lonzo Ball's rookie year was a success or a bust. Allen opened up the phone lines and asked callers this question too. Plus, Laker Beat Writer, Bill Oram, came on with Allen to talk Lonzo Ball, Kyle Kuzma and the Lakers. Sliwa asked the question: Would the Lakers be more successful with LeBron/Paul George or Paul George/Julius Randle? Plus, Allen and his crew did "Shootout." Also, our own Brian Kamenetzky came on to talk to Allen about the Lonzo's struggles, Josh Hart's injury and the future outlook of the team. Allen begins by asking, What is the Lakers plan for Julius Randle? Plus, Luke Walton Head Coach of the Los Angeles Lakers, calls in to talk about the team's growth, what influences his coaching style and thoughts on Julius Randle being challenged. And Allen takes calls as people reactions to Luke's comments. Mario has the topics ready, it's time for Shootout! Plus, Allen asks, What Lakers line up can make a playoff run? Eric Pincus from Bleacher Report calls in, talks about the Lakers acquiring LeBron James or Paul George? What will the Lakers do about Julius Randle? Find out why Allen feels this summer will be different for the Lakers. Allen begins talking about the tough loss to Portland last night but nothing to worry about. Also, he talks about Isaiah Thomas's role. Legendary Lakers announcer Stu Lantz calls in to talk about the Lakers future. How much will Julius Randle be worth this off season? Who is the Alpha on this current Lakers roster? Mario has the topics ready it's time for Shoot Out. These young Lakers are playing to develop a winning culture. Plus, Mike Bresnahan Spectrum SportsNet calls in. And who had a better season between Randle and Ingram? Who is the best closer in the association right now? With the win in Atlanta yesterday, Lakers have matched their win total from last season. Allen Sliwa gives credit to head coach Luke Walton and says Lakers are finding their groove. Julius Randle is playing his best ball but is often overlooked as a key player for the Lakers going forward. Allen is joined by Ohm Youngmisuk who covers the Lakers for ESPN. Shoot Out with Allen Sliwa and Producer Mario. Allen continues to praise overlooked Laker Julius Randle who is playing the best ball of his career. Which rookie has been playing better lately, Kyle Kuzma or Josh Hart? Baxter Holmes covers the NBA for ESPN as he hopes on with Allen to discuss all things NBA and Lakers. Who's better, Kyle Kuzma or Josh Hart. Both are late 1st rounder's and doing a great job contributing this season. Lonzo Ball has looked very comfortable in his first 2 games back. ESPN's Baxter Holmes joins the program. With 25 games left in the NBA regular season, Allen Sliwa wondered what to expect from the purple and gold in the next couple months. Sliwa and his crew discussed what they want to see from individual players on the roster including seeing "more burn" for Lonzo Ball. Also, Allen is not a happy guy because of no Lakers weren't involved in the NBA All-Star game. Plus, LA Times' Tania Ganguli came on to talk Lakers with Sliwa. Allen and his crew reacted to the Shaq/Kobe NBA-TV interview, in which they talked about being teammates and having "beef" with each other later in their careers. Plus, "Shootout." Also, reaction to an ESPN poll conducted by NBA players involving where LeBron will land next season. Allen Sliwa breaks down the big trade that sent Larry Nance Jr and Jordan Clarkson to Cleveland for Isaiah Thomas, Channing Frye, and a first-round pick. Listeners call in and discuss their thoughts on the trade and if they want LeBron James on the Lakers. LA Times Sports columnist Bill Plaschke joins Allen to discuss the trade from last week and what it means for the Lakers moving forward. Shootout with Producer Mario and Allen Sliwa. Allen plays sound from an earlier interview with Lakers GM Rob Pelinka explaining how the recent trade benefits the Lakers. Who should be on the floor closing the game, Isaiah Thomas or Josh Hart? Listeners call in and give their opinion on who should close out games. With the NBA Trading Deadline days away, Allen Sliwa wondered if the Lakers should get rid of some of their assets, mainly Juilus Randle and Jordan Clarkson. Sliwa took calls on the topic, as most Laker Fans don't want to give up on this young team. Allen and his crew were trying to figure out what the Lakers will do in the Summer of 2018, in which LeBron, KD and Paul George will be available(hopefully). More calls on the Lakers' future as well. Plus, "Shootout." With the Clippers trading away their franchise player in Blake Griffin, Allen Sliwa wondered if it's time for the Lakers to let go of Julius Randle and Jordan Clarkson. Our own Andy Kamenetzky joined Allen to talk about what the Lakers could possibly do during the trade deadline and how they are playing at the moment. Allen looked at the "effect" that the Blake Griffin trade has on the Lakers and the whole NBA. Allen thinks that the Clips had to sign Blake before the season started to get "assets" back if they were to trade him. Plus, could Blake have been a Laker? Allen thinks the Lakers will trade one of their prized young players in Julius Randle and Jordan Clarkson. Allen and Our own Jorge Sedano came on with Allen to talk Lakers and other NBA hot topics. Also, Rob Pelinka is doing a heck of a job with the Lakers. Allen and Super Producer Mario did their own NBA All-Star Draft. Also, every one's favorite segment, Shootout. Plus, Lakers.com's Joey Ramirez came on to talk about the current rotation, how the Lakers been playing without Lonzo Ball and trade possibilites. Allen begins talking about the impact Lonzo Ball has on the team when he misses games. What's the differece between the best player vs. the most important player in the team? Allen takes calls on he important vs. best player debate. Royce Young, Espn NBA writer calls in to talks about the Lakers vs. OKC and the Paul George situation. Allen and Mario have the topics ready, it's Time for shoot out. If Paul George is to come out to LA, he has got to have an idea of what the Lakers identity is. Reports say that no player would come to the Lakers because of LaVar Ball? Does the Lakers front office have Luke Walton's back? Allen Sliwa addresses the recent news that the Lakers front office are looking to replace head coach Luke Walton. Thinking this news is outrageous, Allen says Lakers need stability from the head coach position. Listeners call in to give their opinions on if Luke should be replaced. Shootout with Allen Sliwa and Producer Mario includes Allen's interactions with Spurs star Kawhi Leonard, how to get LeBron to LA, and All-Star game talk. Spectrum SportsNet Lakers analyst Mike Bresnahan joins Allen to discuss the team's recent win streak, Laker's young studs, and Pau Gasol's jersey. Allen continues to discuss the idea of Pau Gasol getting his jersey retired by the Lakers. Allen Sliwa and Producer Mario start the hour with the first Shootout of 2018 which consists of LaVar Ball, Isaiah Thomas, and Coachella. Allen discusses Paul George's return to LA as the Thunder are in town to play the Lakers. Serena Winters from Lakers Nation and Spectrum SportsNet hops on with Allen to discuss the recent losing streak and looking towards the rest of the season. Happy New Year! First Lakers Talk of 2018 includes Allen Sliwa giving out his reasons for why the team has the worst record in the West. Fan reaction as to why the team is the worst in the west. Lakers sideline reporter Mike Trudell joins Allen to discuss the team's mentality in the midst of a 7 game losing streak. Allen Sliwa discussed the best play with the highs/lows of 2017 for the LA Lakers. Sliwa gave the Lakers a "passing" grade so far in this young season. Also, ESPN's Amin Elhassan came on to talk Lakers and other NBA hot topics. ESPN's Amin Elhassan stuck around with Allen to talk the NBA's hot topics, including if he foresees Julius Randle with another team next season. Plus, "Shootout." Also, Allen took calls on the Lakers. Allen begins talking about the huge game Kyle Kuzma had in Houston. Moves on and talks about going on the road following the Lakers and tells a story about New York. ALso, Allen and Mario have the topics ready for shootaround. Last, Who is having a better rookie season Lonzo Ball or Kyle Kuzma? Allen jumps right it with the 2 straight wins on the road for the Lakers as the talk has been surrounding Lonzo Ball not playing in the 4th quarter. Allen also has thoughts on what Magic said regarding free agent players further out than just next season. Voice of the Lakers, John Ireland jumps on to discuss the latest news with the purple & gold. After the latest edition of 'Shoot Out' with super producer Mario, Allen gets into how Jordan Clarkson & Julius Randle are making their case to get paid long term by the purple & gold. Also, our own Travis Rodgers joins Allen to discuss the talk surrounding Lonzo Ball not playing in the 4th quarter during the Lakers' 2nd straight win. Silwa reacted to LaVar Ball pulling his son LiAngelo out of UCLA and to the reports that LaVar will try to "steer" LiAngelo and LaMelo to play basketball overseas professionally. Also, our own Mychal Thompson came on to talk Lakers, Warriors and other NBA hot topics. Allen Silwa is ecstatic because Brandon Ingram is "finally" playing up to his potential the last couple games. Lakers' TV Play-By-Play man Billy MacDonald came on with Allen to talk about the "light at the end of tunnel" for the Lakers. Shootout with Producer Mario talks about the biggest stories in the NBA. Next, they take some fan reactions on Twitter. Kevin Durant and Steph Cury have some comments for Lonzo Ball. Former Lakers Beat Writer, Mark Medina who now writes for the Golden State Warriors joins Allen to preview tomorrow's matchup with the Lakers. Allen Sliwa opens the show talking about the disappointing loss against the Clippers last night. Listeners call in to give their thoughts on the team. Shahan Ahmed covers the Lakers for NBC LA as he joins Allen to discus Lonzo and the rest of the squad. Allen quickly talks down the talk of Lonzo being a bust citing where is exceeding in other aspects of his game. Allen Sliwa and Super Producer Mario react to stories from around the world of hoops. The Celtics are killing it with a 16 game winning streak but can they takeout the Cavs in the Playoffs? Plus, ESPN NBA Insider Brian Windhorst talks about Lonzo walking away from the fight with the Suns. Allen Sliwa reacts to Lonzo Ballâ€™s triple double and Julius Randleâ€™s big game in the win over the Nuggets. Did Lonzo do the right thing by not getting involved in the fight with the Suns? Lakers Color Commentator Stu Lantz shares his thoughts on the young Lakers core. Allen Sliwa and Producer Mario talk the latest basketball news in Shoot Out! A surprise caller from Latvia. 76ers play the Lakers tomorrow and Allen asks which team is in the better position for the future. Lakers team photographer Andy Bernstein hops on with Allen to talk about his new show on Spectrum SportsNet. Allen Sliwa discus last night's Laker victory against the Suns. Lonzo is a good mood despite not playing in the 4th quarter last night. Allen compliments Zo's demeanor so far this season. Jordan Clarkson is leading the team in scoring but, seems to be the forgotten Laker. Serena Winters from Lakers Nation and Spectrum SportsNet joins Allen to discuss the latest with the team. Is Luol Deng on his way out or is his contract just too much to move for the Lakers? Where does Randle's future lay with the team? Plus, Mike Bresnahan of Spectrum Sportsnet stops by to discuss the 5-5 start for the Lakers. Lakers are 5 - 5 to start the season & have their first real test in a 4 game road trip. Allen catches up with Stephen A. Smith to get his thoughts on the team's first 10 games. Also, what grade do you give the Lakers so far to start the season? Allen Sliwa discusses his list of players to lookout for during the season and talks about the most clutch moments in sports. Plus, Kelvin Washington stops by to talk about the Lakers season thus far. Did the Lakers give up too soon on D'Angelo Russell? 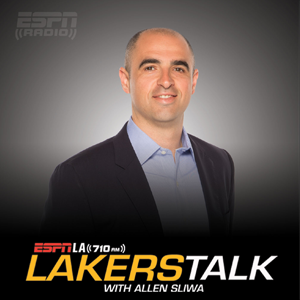 Plus, ESPN's Ramona Shelburne joins Allen Sliwa to discuss the Clippers and Lakers seasons. ESPN senior writer of the Undefeated Marc Spears joins Lakers Talk to discuss the state of the Lakers and Allen Sliwa breaks down the top 5 Dodger and Laker moments of all-time. Is Lavar Ball hurting the Lakers? Can Brandon Ingram be the face of the franchise? Plus, Lakers shooting guard Josh Hart joins Allen Sliwa on Lakers Talk to discuss their game against the Pelicans. Who will have a better rookie season, Kyle Kuzma or Lonzo Ball? Plus, Allen talks about his NBA Power 5 teams, reacts to Shaq's interview with Jimmy Fallon and L.A. Times Clippers beat writer Brad Turner joins the show. What should we expect Opening Day as the Lakers take on the Clippers? Did we learn anything this preseason? Plus, Allen Sliwa talks about the Lakers decision of not offering Julius Randle a contract extension.